Last year, Jennifer Kent’s The Babadook arrived from almost out of nowhere to bring back a sense of dignity and intelligence to the horror genre, making a bold statement that the world of jump-scares and “gore-nography” needs a serious overhaul if it’s to reach those heights again. That is, we could do with fewer films like Annabelle and Ouija, which rely far too heavily on nothing but jump-scares and exploitative/unnecessary gallons of blood, and more films that have the same passion and creativity as The Babadook – or even It Follows, which proudly does for the teen slasher what Kent’s film did for the classic monster movie. Writer-director David Robert Mitchell is leagues away from his debut film, the quirky coming-of-age story The Myth of the American Sleepover, with a sudden genre leap into the type of film that once made John Carpenter a household name. However, his love for this 70s/80s era of horror (spanning from Carpenter’s Halloween to Wes Craven’s A Nightmare on Elm Street) shines all the way though his sophomore feature with inspirations from those key figures and more while also bringing his own style into the proceedings. He brings a tremendous sense of atmosphere into every shot, helped by cinematographer Mike Gioulakis’ unsettling camera work, with some of its numerous wide shots reinforcing that sense of dread and uncomfortable anticipation. Mitchell rightfully recognises how the terror comes from the ambiguity of it all, never letting us in on what “it” exactly is or why “it” does what “it” does. All we know is that “it” can take any form, and will eventually kill you once “it” catches up to you… very, very slowly. It’s such a simple idea, apparently adapted from one of Mitchell’s own recurring nightmares (and boy, does the nightmarish element truly come across), and it’s executed in the chilliest and most effective way possible. Following in the footsteps of Jamie Lee Curtis’ Laurie Strode or even Sigourney Weaver’s Ellen Ripley as defining protagonists in the genre, Maika Monroe brings to life a simple yet entrancing lead in the form of Jay, who once we get to know her more we’d gladly stick around with no matter what. 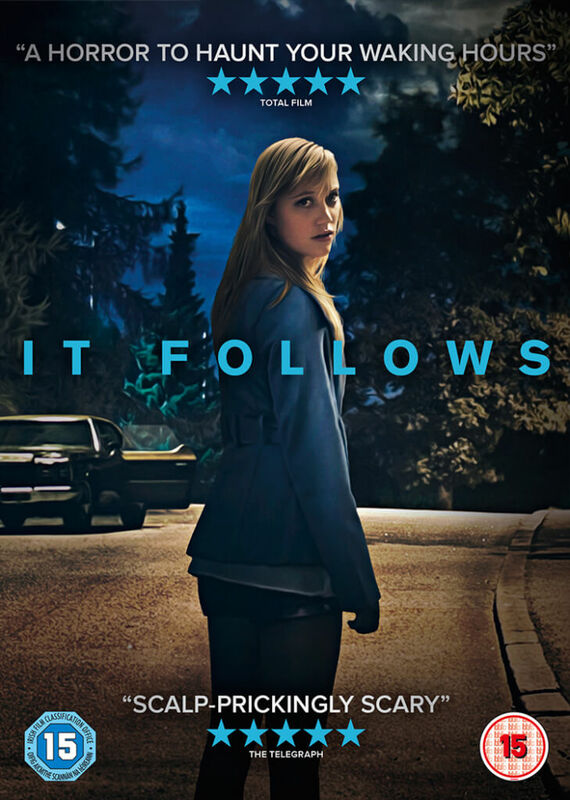 We hesitate to call her an example of the popular “final girl” trope found in most horror films – look it up if you’re not sure what that specifies – because she does not necessarily fit that mould, in one of the film’s many refreshing takes on old clichés. Though she displays only a handful of familiar tropes – she is the lead investigative consciousness of the film, she shares a unisex name etc – they are each given their own twist that helps them becomes surprisingly more original; heck, she even ditches that “virgin” element very early on, which in turns sets all events into motion. She is supported by her own group of friends who all seem to be as much outsiders as she, without a single jock or other archetype among them (the closest to a jock this movie is Daniel Zovatto’s next-door boy Greg, but that’s only due to his lanky and muscular look; other than that, he’s about as far away from archetype as the next person). They’re all fine support, each with hints of their own unique personality and grasp on the camera, and you’re thankfully never counting down the minutes until one or more of them is axed off. 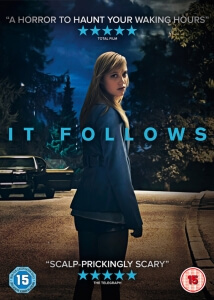 It’s good that a modern horror film centred around teens doesn’t have to resort to time-old tropes and stereotypes, and that it can just let these people be people in however way they want. The “it” of the title is certainly a chilling screen creation, not entirely without its flaws – how it functions is left intentionally vague, but it perhaps may have been more effective if only the person involved could feel its effects, without giving it fully away – but still very memorable in its simplicity. As for what it represents, prepare yourself for an onslaught of academics and the like calling the slow-moving monster transmitted exclusively through sexual activity as a personification of every single STI you can imagine. 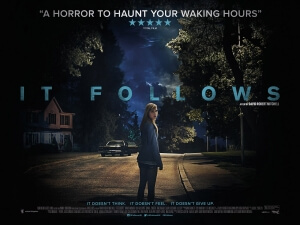 We would be lying if we said we didn’t see the connection ourselves, but though the subtext is certainly obvious it’s still a strong film in its own right, with a creepy idea executed wonderfully by its talent both in front of and behind the camera. 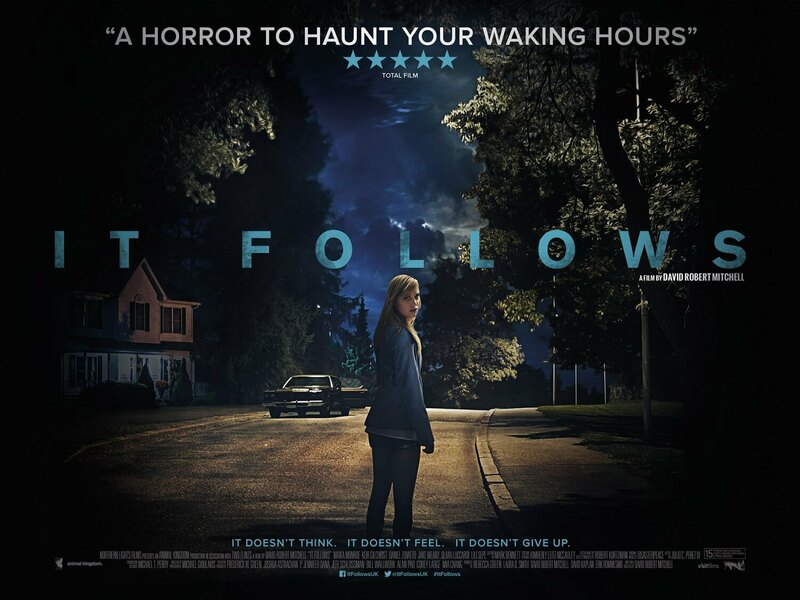 Though it’s not entirely perfect – there are perhaps one or two unneeded jump-scares placed thoughout – It Follows is still a very strong modern horror that stands alongside The Babadook as a convincing argument that finally, after all these years, the horror genre as we know it is finally headed in the right direction. Buy it in stores, online, digital download and more now!